Christians and seekers have gathered for worship in Warren and Meadow Lea United churches for over 100 years! As the generations have proceeded, the community has expanded to include Woodlands, Marquette, Meadows, and Stonewall. Alternating between Warren and Meadow Lea, Sunday morning worship (10:30 am) is a great opportunity to catch up with neighbours, share what life has offered through the past week and be renewed with faith for the times to come. There is never a dull moment, with plenty of laughter, great fellowship, and biblical sermons that address the concerns of this time. 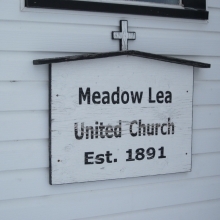 Everything that happens with Warren and Meadow Lea United Churches is open to anyone who would like to be involved in any way. Christian ministry includes prayer, pastoral care, outreach, worship, education and fellowship. Weddings, baptisms, funerals and communion are special times in the church community and Christmas and Easter are wonderful moments to share with the wider community. Patricia Baker is the Minister of Warren-Meadow Lea Pastoral Charge. She engages in pastoral care, hospital visits, spiritual conversations, the work of the boards and committees and overall spiritual encouragement to the church and wider community.